Palestinian scholar of the third century; disciple of Johanan (Yer. Yeb. viii. 9b). He seems also to have sat at the feet of Ḥanina b. Ḥama, for he reports thelatter's halakot and haggadot, and this even in the presence of Johanan, who on one occasion expressed himself as opposed to an opinion of Ḥanina's quoted by Jacob (Yer. Ḥal. iii. 59a). 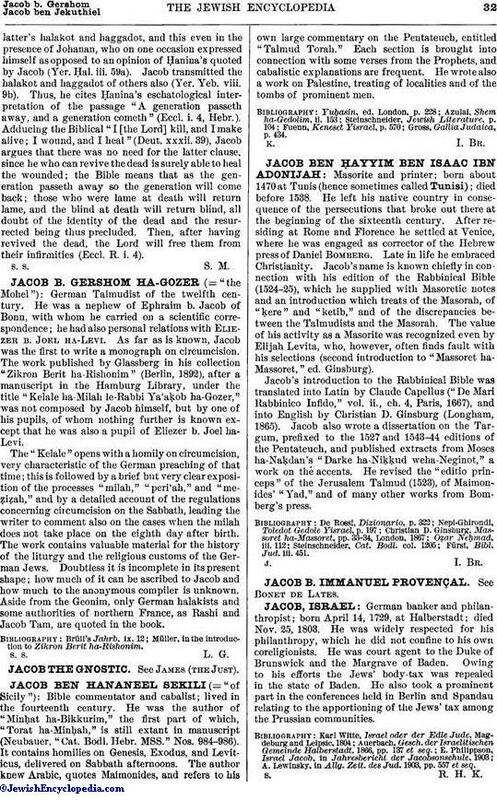 Jacob transmitted the halakot and haggadot of others also (Yer. Yeb. viii. 9b). Thus, he cites Ḥanina's eschatological interpretation of the passage "A generation passeth away, and a generation cometh" (Eccl. i. 4, Hebr.). Adducing the Biblical "I [the Lord] kill, and I make alive; I wound, and I heal" (Deut. xxxii. 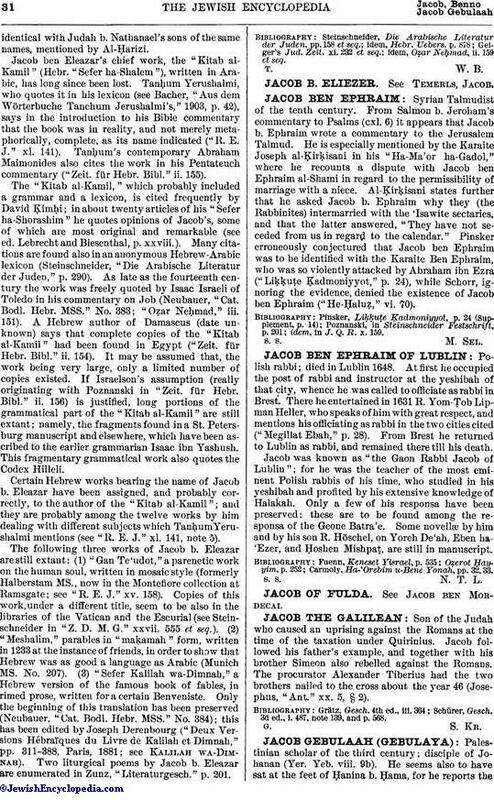 39), Jacob argues that there was no need for the latter clause, since he who can revive the dead is surely able to heal the wounded; the Bible means that as the generation passeth away so the generation will come back; those who were lame at death will return lame, and the blind at death will return blind, all doubt of the identity of the dead and the resurrected being thus precluded. Then, after having revived the dead, the Lord will free them from their infirmities (Eccl. R. i. 4).